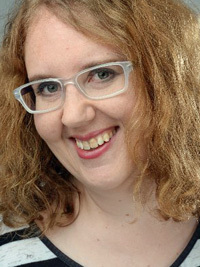 Verena Hefti is founder of Leaders Plus, a social enterprise to support leaders with young children to continue their leadership careers, before which she ran leadership development programmes for ten years in Switzerland, Denmark and the UK, most recently as regional director at Teach First. After giving birth to baby Naira, Verena decided to help more new parents stay on the leadership trajectory and founded Leaders Plus. In her spare time, she volunteers as Chair of Trustees at Lewisham Citizens Advice. I have been privileged to enjoy an international career, firstly being elected t0 manage leadership development programmes for AIESEC in Switzerland and then in Denmark as vice president for people development. More recently, I oversaw the leadership development programme for the charity Teach First as South East director. Then, I became pregnant. As my bump grew, the work small talk shifted – people stopped asking me about my professional ambitions and talked to me about nursery decoration schemes, often making assumptions that my career would take a backseat. My partner and I decided to keep a tally for fun to see who was asked: “Are you going to give up work or go part time?” We gave up after I hit 10 and he 0. Leaders Plus is a social enterprise enabling talented women and men with young children to continue to develop their leadership careers. Too often talented parents feel they have to choose between being a good parent and a fulfilling leadership career, we want to change this. We do this through high quality training, mentoring, access to role models and building a community for peer support. Our workshops focus on how to continue to develop your career while looking after young children and manage your work life balance. I decided to do something positive about this and set up an event in the House of Commons with the help of my local MP, Heidi Alexander. 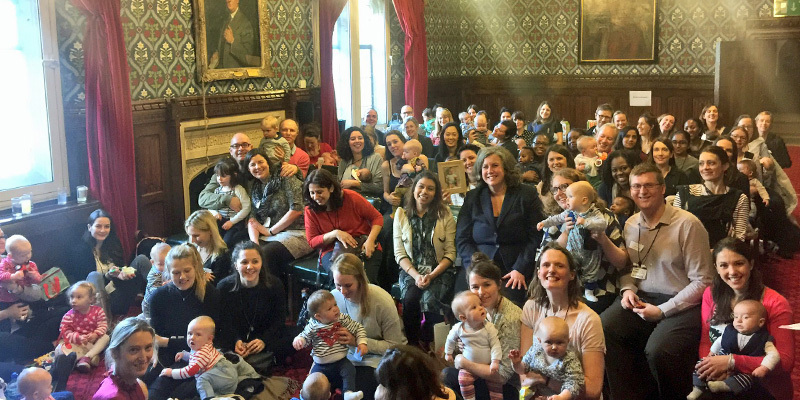 60 parents came along with 50 babies to listen to some of the most inspirational leaders in the UK who combined successful leadership careers with being loving parents to babies, such as Karen Blackett OBE [Mediacom Chair] or Tulip Siddiq MP. I was blown away by the huge demand by ambitious parents and I decided to offer them much needed support and set up Leaders Plus. At the moment, the gender split is probably about 85% mums and 15% dads. When I set up Leaders Plus, I was often encouraged to choose a name such as Mum Leaders, but was determined to include all genders. This is important because true gender equality can only be achieved if everyone can make career and childcare choices, regardless of their gender. Our topics focus on career development within the context of being a new parent. 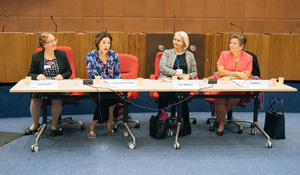 Recent workshops focused on issues such as how to navigate work place power games or how to use your strengths gained on parental leave to develop your career. We know line managers and partners, if present, are the two most important people determining whether a new parent can continue her / his leadership trajectory, so we plan to offer training for line managers and parents jointly. We also run a session for couples to give them the chance to define their personal vision for their career success. Most importantly, our workshops are structured in a way for parents to get to know likeminded people and build confidence as all too often parents who don’t want to choose between a leadership career and being a loving, involved parent feel isolated. A lot of our work involves positive role models, it is incredibly reassuring to hear from experienced leaders such as Geraldine Strathdee CBE that you don’t have to rush leadership careers and that it is fine not to apologise when you leave the office at 4pm. I chose to make many of our events baby inclusive because I want to create a unique professional development environment where it is OK to be both an ambitious leader and a caring parent at the same time. I wanted to break a paradigm and show that leaders with young children are often passionate about developing their careers. On a practical level, we bring covers for sockets, baby snacks and always have an emergency nursery rhyme ready if things get too loud. Everyone is always surprised how well behaved the babies are – they clearly enjoy their parents developing themselves as leaders! There is most certainly is a motherhood penalty in the UK employment market, both in terms of actual money but also perception – the gender pay gap is 17% at age 40 and 11.3% at age 30, the average UK childbearing age is 30 – you figure it out! A recent study by the Fawcett Society found that men are perceived as more committed and therefore more employable when they have kids while for women it is the other way around. As a result, fathers’ earnings increase while women’s decrease after having children. However, some might say men have it as hard when combining leadership careers with taking an active role in childcare: A recent study by Bain & Co found that men’s flexible working requests are twice as likely to be rejected than women’s, and a male Leaders Plus supporter in a large professional services firm was recently told to “choose between career and family” when he requested to go on shared parental leave. Leaders Plus has just won the RSA Catalyst Award to run a Leaders Plus fellowship programme, a programme for talented individuals with young children. This high profile selective programme is for parents with young children who want to continue their leadership careers. Successful applicants will get access to inspirational role models, mentoring and a programme of workshops and events. The programme will help fellows grow in their confidence, develop their career in line with their personal values and give them access to a supportive peer network. It will also include practical support, for example by a sleep consultant. New parents can express interest to take part here. We know that the imposter syndrome often prevents individuals from putting themselves forward, so if you know a friend who’d be a great candidate, do recommend them. Recently Leaders Plus has also been selected for the prestigious Cambridge University Social Venture Incubator programme. As part of that we will be developing our training and development and networking offer further. To be kept in the loop, you can apply to join Leaders Plus as a member here. Together with our patron Tulip Siddiq MP, we are preparing our next House of Commons event and we will make all our members aware when the date is set. We are working with employers to offer training, mentoring and events and are interested to hear from thought leaders and employers interested in partnerships. 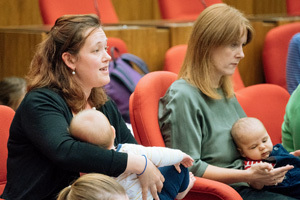 Our next event, delivered in partnership with Society and Impact Hub Westminster, Charity CEOs on parental leave – what works? is designed to identify how we make it work when the people in top jobs go on parental leave, for them and their organisations. If you are a charity CEO or Chair and would like an invitation, you can get in touch.